We are excited to introduce the Muni Art 2018 artists. View their interviews below, and keep an eye out for their artwork in Muni buses January 2018. This series of geometric illustrations was created to show a sample of the diversity that exists in the Bay area. The name is derived from the seven by seven square miles of the City, and the 7 most common languages spoken throughout the Bay Area. Many pieces have loud bright colors contrast the subjects, which often are withdrawn and meditative. Poetry speaks often of the invisible, while art is able to paint the invisible- a feeling, a moment or a bond. This series visually communicates feelings otherwise unseen. The use of simple lines, familiar monuments and abstraction will hopefully spark conversation, inspire kindness or ignite self-reflection. WORDS UNFOLD is a series of visual poems that illustrate words spreading out to reveal dreams within dreams of poetry. Using acrylic, watercolor and digital painting each piece explores a visual interpretation of a poem. Creating visual wordings within layers of depth, this work invites you to breathe color, dive into your passion and explore the unseen. 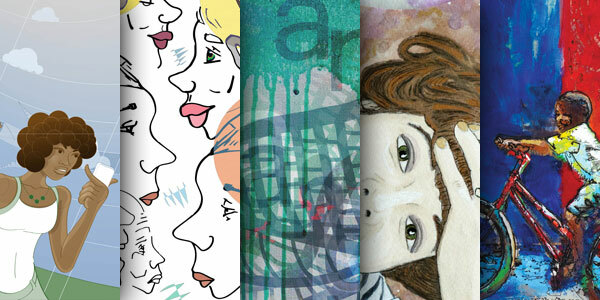 Lyrical City is a series of watercolor/gouache paintings that explore emotion through portraits. Ranging from contemplative to exuberant, each portrait along with vibrant background colors seek to evoke memory. Some of the pieces include a collage of paintings to represent our journeys of growth, change, and an interweaving of the complexities within each of us. San Francisco’s humanity informs my art. The diverse culture, and liberal thinking, has been my main inspiration since I first arrived here from my native Taiwan. From macro to micro is my view of San Francisco. I believe that together, through love, compassion, and hope, we can inspire each other to come together on Muni.